Choosing A Digital Marketing Agency? Watch For These Red Flags. It can happen to the best of us: You enter into an agreement with a marketing agency, consultant or service provider even though you had a few misgivings on the way to sealing the deal. If it turns out that your early concerns were valid and things go south, you learn from your mistake and vow to never ignore your instincts again. Chalk it up to the normal process of becoming a better decision-maker. But what about the agency candidate that didn’t make warning bells go off? Might there have been a few red flags that were easily missed? If you’re searching for a new digital marketing agency, here are five red flags that should have you digging more deeply. 1. Promising insanely great rankings. If this is the only red flag you see, it’s the one that can save you from making a bad choice: The agency that says they guarantee your website will be at the number-one spot on the first page of search engine results. Can a great agency get you on the first page or even in the first slot on the first page? Absolutely (someone has to be in that spot) — but they can’t guarantee it. If they do make such a promise, you must ask pointed questions about how they’ll do it. Make sure they don’t intend to resort to bad tactics, such as participating in link schemes. Also watch for promises of extremely fast results. 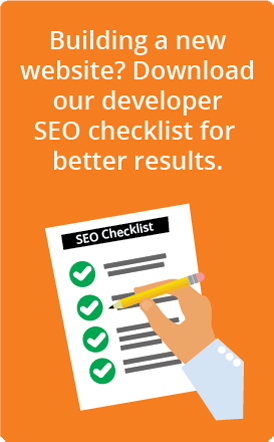 We tell prospective clients that it can take three to six months to move the needle on rankings, and even longer for a website that’s new or that has existing negative SEO factors. Executing an effective online marketing strategy and sustainable campaigns takes time, work, and patience. There are no shortcuts. 2. A singular focus on website traffic. It’s a great feeling for business owners or marketing managers to see their company’s website visitor numbers climb. So how can focusing too much on site traffic possibly be a problem? Let’s say you’re in the staffing business, helping companies find employees with qualifications for a highly specialized position, such as widget tester. You have a pool of experienced widget testers who are ready to go to work. Your agency does its keyword magic, your business begins to appear in more search results for “widget tester,” and your site visitor count is better than ever. Great, right? If traffic-building has been the most important goal at the expense of all others, you may notice after awhile that you haven’t gotten very many viable leads. Upon closer inspection, it turns out that a lot of your new traffic is coming from the wrong visitors — someone who just wants to find a widget store, or a student who wants to learn how to become a widget tester, or a guy who needs a widget repair service. You may find that your bounce rate has spiked along with your visitor count, because you don’t offer what those visitors were looking for. The agency worth hiring is the one that can tell you all about the dozen or so other factors you need to address to get your online contact form filled out or your phone to ring. If your website traffic numbers show incremental improvements and the number of qualified leads you acquire goes up month after month, you and your agency are doing something right. Your digital marketing partner is helping you attract more of the right visitors and convert them into engaged potential clients, the most important goal of all. 3. An overemphasis on digital marketing tools. Third-party tools are essential for getting some digital marketing tasks done, and nearly every agency needs them. Such tools become a negative factor, however, when they’re used as substitutes for the day-in, day-out work of digital marketing. In addition, tools are only as effective as the people who use them — a tool that gathers data, for instance, has no value until someone interprets that information and gleans insights that they can use to improve the digital marketing work they do for you. It’s becoming easier to automate a great deal of a company’s marketing and some of today’s tools are remarkably intuitive. But if you’re concerned that a prospective agency will rely more on tools than on their talent and skills, make sure you understand just how such technology will be used. 4. A turnkey or off-the-shelf service package. One of the best aspects of digital marketing is the ability it gives us to customize our services to a degree not possible with older or more traditional channels. Do you have a local business in a highly specialized niche? Or is your company an enterprise that has an internal marketing department collaborating with a number of outside agencies or service providers? Wherever you are on the spectrum, your digital marketing agency should develop a strategy using a mix of services tailored to your very specific needs. Some small business owners may feel more comfortable with a turnkey solution if they’re just starting out with digital marketing. For most other companies, however, a one-size-fits-all digital marketing package just won’t fit their needs. If a prospective agency offers only a prefab solution, you’ll likely end up with services you’re paying for but don’t need, and missing out on some that you do. If they are accounting for hands-on work, it may be that it will be performed by a relatively unskilled person or be outsourced to a low-cost contractor. Your account may not be all that important to the agency that goes for volume over quality on their own client list. You may not receive some of the services that help ensure success, such as in-depth reporting on the performance of your marketing campaigns. It can’t be stressed enough: There are no magic marketing bullets. There’s just the work of developing creative strategies, paying attention to the ups and downs of campaign performance and adjusting accordingly, and mining mounds of data to find those nuggets that can put you one step ahead of your competitors. If you choose the right agency, though, you’ll get what you pay for and more.